See the Check-In Overview and the Getting Started articles, if you have not already. 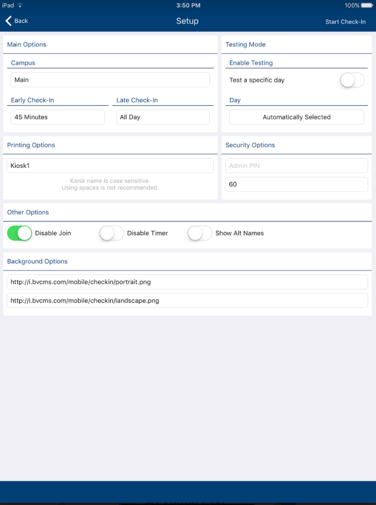 After opening Check-In and logging on, you will be presented with a Settings page for PC Check-In, and a Setup page for Mobile Check-In. Once you select the settings, they will be remembered the next time you log on. The screens for PC Check-In and Mobile Check-In contain basically the same information, just in a little different order. If your church has multiple campuses, you will select from the dropdown menu the Campus where you are doing Check-In. If you have only one campus, you will leave it blank. The purpose of selecting the Campus is to limit the organizations displayed for Check-In to only those for the specified Campus. Note the caution regarding All Campuses. You will use the Campus selection All Campuses very rarely. If you select that when you start up Check-In, anyone looking for a class to visit will see all classes / meetings at all of your Campuses for any org that has Allow Self-Check-In selected and has either a Meeting scheduled or a Schedule for that day. This is to be used only at a kiosk where you intend to display all possible classes at every one of your Campuses. You would not want to use this on a busy Sunday morning. It has a very limited use case. Example: If you are having a large rally, and everyone is coming to the same place, instead of their normal Campus, and you want them to be able to check into their campus-specific Life Groups. This would allow for that. This will default to the current day and time. The only time you ever need to select the day is when you are testing Check-In. Mobile Check-In will also default to the current day and time. Select Enable Testing only when you need to test Check-In, and then select the day for which you want to test. Mobile Check-In on the iPad will display Testing Sunday: Turn Off at the top of the screen. Press that text to return to normal mode for the current day. On the Android it will display similar text. To turn off testing make sure you are in Admin Mode, and then press the Menu option on the device and select Turn Testing Mode Off . Select the amount of time prior to the start of a scheduled meeting that you want an organization/class to display and allow someone to check in. 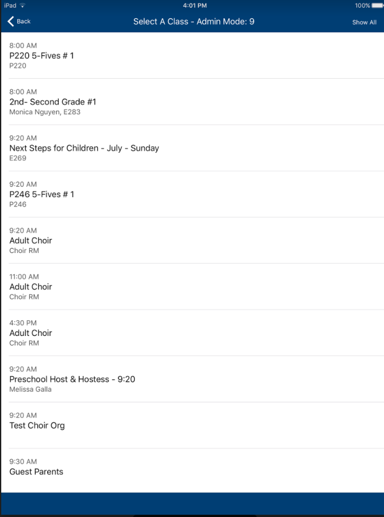 If you use check-in on Sunday mornings and also on Sunday nights, you will not want the PM meetings to display when people are checking in for the morning classes. However, allow enough time for your teachers/volunteers to check-in early. Also, if you have meetings at multiple times on a Sunday morning, you will want those who will be attending more than one hour to be able to check in for everything they will attend without having to return to the kiosk. Select the amount of time after the start of a meeting that you want someone to be able to check in. Normally, you might set this to 30 or 60 minutes. If you are not in the Central Time Zone, where our TouchPoint servers are located, make sure you have added the TZOffset setting to your database. When you are in testing mode on Mobile Check-In you can select All Day for the Early and Late Check-In times. This will allow you to test any time of day without encountering a time issue. However, you would never use that option other than when testing Check-In. The following settings are only on the PC Check-In Settings page, because the printer must be installed on a PC. Select Print to Printer if you are using PC Check-In with one printer per PC. Select Print from Server if this PC / printer is being used to serve multiple kiosks, or if you are printing from tablets using Mobile Check-In. Leave empty if you selected Print to Printer . If you selected Print from Server , enter the name(s) of each kiosk / tablet that will print to this PC and printer. Separate the names with a comma. Select the printer connected to that PC. Use this only if you are using labels that are not either 3 x 1 or 3 x 2 inches. Select this if you do not want your guest labels to include the extra label with the location of the child’s room. This applies only if you are using Datamax printers (which we no longer recommend). You need to check this in order for the last label to completely leave the printer. If this is checked, the parents will receive one security label for each child for each meeting they checked into. The default is to print one security label per family, regardless of the number of children or the number of meetings they attend. Some churches use this setting so that they can keep the security label when the child is picked up. They affix it to the roll sheet, to easily see that a child has been picked up. The following is used on the Mobile Check-In Setup and for any PCs/kiosks that are using another PC for printing. Enter the name you are assigning to that mobile device or PC kiosk. That is the name you will enter as the Kiosk to Print For on the PC Settings page on the PC where you have your printer (see above). Example: kiosk1, or iPadA. These are case-sensitive, and we recommend not using spaces. Each kiosk / tablet must have a unique name. On each tablet or PC (that is printing to another PC / printer), enter only the name of that specific device. On the PC (with the printer), enter the names of any tablets / kiosks printing to that printer. These are options you can select on the Settings page for PC Check-In, but they display automatically in Mobile Check-In when creating a new record or editing an existing one. They are not required, so you can easily skip them in if you do not need that information. Check this if you want to capture the name and phone number of an emergency contact. Check this to provide a text box for you to enter the name of the church the person attends, if applicable. Whatever is entered in this field during check-in, will be added in the Previous Church field on the person’s Profile > Member tab. This provides a text field for you to enter the grade for new records or when editing existing records. It will appear on the person’s record on the Personal tab. Grade is not an option on Mobile Check-In. Enter the 4-digit PIN number that will be required before the Magic Button will be activated (PC Check-In), or to activate Administration Mode (Mobile Check-In). Enter the number of seconds you want to allow before someone must enter the PIN number again. The first three items below are only available on PC Check-In. Always leave this selected, unless you are testing Check-In on your PC. Leave this checked for your touchscreens. You would only want to disable this if you were testing Check-In on your PC. This option is available on the PC version only. After selecting the settings for a specific PC, enter a name for those settings. Then click Save to store them on the server. You can select that option on another device instead of having to select each setting. When this is selected, the screen will time out and revert to the keypad screen if the person does not complete their check-in within a certain number of minutes. This is a security feature and you will always want it enabled when using normal Check-In. When testing or demonstrating, you can disable it. When this is checked, the Join Class (and Drop Class) option on the Menu will not activate (for PC Check-In). On Mobile Check-In, you will not see those as options. Disabling Join forces everyone to first visit a class as a guest, instead of joining and becoming a member right away. For a new guest, you typically will want to capture their visit as just that - a visit - not as joining the class that first day. Labels are printed for guests that are different from member labels, and you would lose that feature if you did not first have them visit a class. Many churches prefer to handle dropping and adding members in the office, not during Check-In. When you select this option in the TouchPoint Mobile Check-In, the person’s Alt Name will display in parentheses after the first and last names. 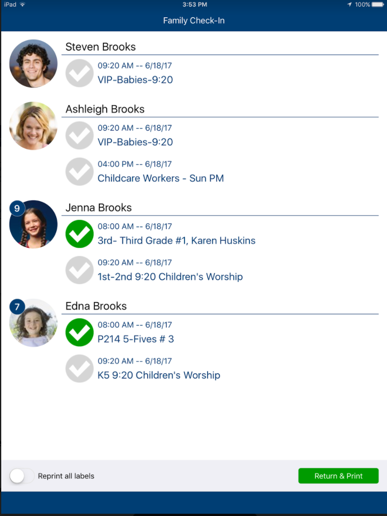 The Alt Name field was added as an option in TouchPoint specifically for churches with members who use their Chinese name. They can put the Chinese characters in that field and have that display in Check-In. This name will also display in other places as well, such as printing roll sheets. 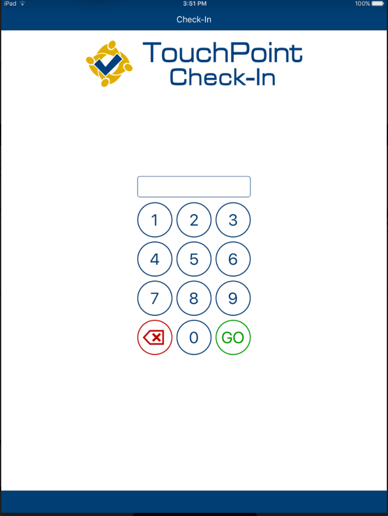 After you have selected the appropriate settings, press Start ( Start Check-In on Mobile) to display the keypad screen and begin Check-In. This is a special use type of Check-In for monitoring those using recreation facilities. It requires special set up prior to use. The options below do not display on Mobile Check-In as Building Check-In requires a PC. It is designed to use dual monitors - one for the person checking in and the other for a staff member or volunteer. This 2nd screen will display the photo and any notes about the person checking in. Check this box ONLY if you are using the special Building Check-In. Enter the name of the Building Check-In script from your database. The following are screenshots for the TouchPoint Mobile App. The PC version is very similar.